The Truvox Orbis Compact polisher scrubber weighs just 22kg, which gives the optimal balance between cleaning performance and ease of use. This light weight, combined with a low profile, gives the Orbis Compact polisher scrubber stability plus unrivaled responsiveness extending the possibility of machine cleaning to confined locations which have previously had to resort to hand mopping. 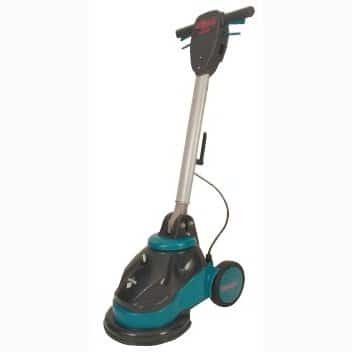 The Orbis Compact polisher scrubber has high brush pressure for scrubbing hard floors effectively yet its low operating noise level means minimal disturbance. With a specially designed carpet brush the Orbis Compact is as capable on carpets as hard floor surfaces. Using low maintenance carpet encapsulation chemicals, the Orbis Compact provides superior and effective cleaning to all carpet areas as well as hard floor surfaces.